While this can be used as a notebook the keyboard is not fixed and the screen would need propping so this Latitude device is really a Tablet with a keyboard attached so probably best described as a Tablet/Notebook to be accurate. The Latitude 5285 is a good pick if your job requires a detachable 2-in-1, because the variety of configurations Dell offers means you’ll be able to find one that fits your budget and computing needs. 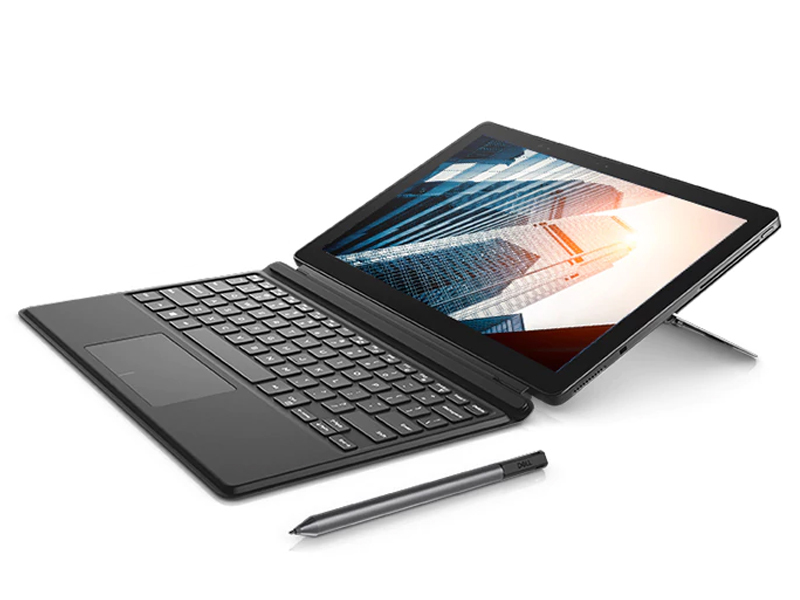 It also offers a host of security options that you won’t find on more consumer-focused 2-in-1s like the Microsoft Surface Pro. And it boasts the durability and long battery life that road warriors require. With the Dell Latitude 5285, employees get the benefit of a contemporary 2-in-1 design, while IT can rest easy knowing the Latitude 5285 comes with the latest security features and Dells’ well-known customer support. For any business that already relies on Dell hardware, the Latitude 5285 is a natural fit to mobilize your workforce. The $1,899 HP EliteBook x360 G2 offers better endurance, but its bend-back design means you don't get a detachable display. But, if you need an up-to-date Kaby Lake CPU and a nimble, durable design, the Latitude 5285 2-in-1 is worth considering. The Latitude 5285's solid speed and sleek design make it a joy to work on and a laptop worth showing off. However, its short battery life is hard to ignore. Positive: Stylish design; nice connectivity; beautiful screen; good speakers; comfortable keyboard; high performance; decent battery life. Negative: Thick frames; poor display; no fingerprint sensor; no face ID. Once again after CES 2017 it looks like the tablet market is set to heat up with strong competition against Microsoft’s Surface line. With Dell unveiling their own take on what looks somewhat similar and at a glance could possibly mistake it for a Surface, the Dell Latitude 12 5285. The very concept of packing the power of a notebook and flexibility of a tablet in a single package isn’t new and really does make “imitation is the sincerest form of flattery” ring true. So, what’s packing under the hood of this alleged imitator, for starters most top end tablets seem to be packing the same Intel 7th gen low power i7-7600U processor which doesn’t make much of a feature other than boring checklist to be ticked off. But for a premium competitor to the Surface it has more memory than is expected of it at 16GB worth, it seems overkill for a tablet marketed towards business users nonetheless the additional memory is welcomed. It also comes with a NVMe based 256GB SSD which by itself is worth more than the actual tablet itself which is another bonus. Going over to chassis construction, the Latitude 5285 is constructed from high grade magnesium alloy which not only gives it the premium feel but sturdiness and excellent rigidity with little to no flex. The inbuilt kickstand is equally resilient as well. One feature of the kickstand is its auto-deploy which is activated by the two tabs protruding from the bottom, when the tablet is placed on a flat surface it releases a catch mechanism which flips the stand. This feature is also carried on when used with the travel keyboard. As with user inputs, Dell offers the Travel keyboard as an option instead of having it included by default which isn’t bad considering the tablet’s asking price. The keyboard mainly features a chiclet design with the ability to set it at an angle or laid flat, key travel is considerably shallow but quite decent in terms of feedback. The keyboard also features an integrated backlight with 2 steps of brightness which is good. However, the only negative is when propped at an angle it flexes more than it should which should be noted for heavy typists. Following that is the touchpad which feels smooth to movements, surprisingly the click response is much more solid and crisp when compared to full sized notebooks. As with tablets the touchscreen takes the literal centerstage. The touchscreen is a 10-point multi touch display with Corning’s Gorilla Glass which helps to minimize scratches when laid face-down. The actual display unit itself is a FHD IPS panel which seems like a downgrade when compared to the Surface or even the Transformer 3 Pro’s higher resolution however it still provides a sharp viewing experience. While the resolution might seem disappointing it counterbalances this by being a very bright panel when compared to its competition which helps when viewing under very bright conditions. Should the user prefer other inputs Dell also offers a Bluetooth Active Pen powered by an AAAA-cell, however this pen is less suited for artists instead its main use is for note taking. Audio-wise, the sounds are generally well balanced however bass is seemingly nonexistent, Users can also improve the audio quality with the included Waves MaxxAudio Pro software although bass remains nonexistent. Finally, with battery life the Latitude 12 5285 outperforms its competition by a reasonable margin coming in at 8 hours while Wi-Fi surfing which is impressive. To this end the Latitude 12 5285 is a rock-solid competitor to the Surface barring a few minor cinches. 79.19%: This rating is not convincing. The laptop is evaluated below average, this is not really a recommendation for purchase.